Vallauris has been a favorite haunt of ours for as long as we can remember. Famed for its pottery, the town has had its ups and downs. The walk along its main street, starting with Picasso’s famed statue “L’Homme au Mouton”, his powerful “War and Peace” panorama and a collection of his ceramic works in a museum at the top of the hill, and our personal favorite pottery shop Ardéco owned and operated by Gilbert and Martine Azéma at the bottom of the hill, is a nostalgic one these days. The town seems to be more “down” than “up”. Without being too disheartening, however, we were “re-inspired” by what we learned from our latest visit (27 June 2018). At the one end, we took in the special exhibit of “Picasso’s Vallauris Years” that is part of a two-year “Picasso-Mediterranée” project running from 2017 to 2019. At the other end, having been saddened last year by the demise of Gilbert Azéma and the closing of his famed Ardéco, we were thrilled to come across the reopened Ardéco under new management. We are reminded somewhat of the American adage “Washington slept here” as the magnet for tourists to stay in one or another quaint but run-down inn or lodge up and down the East Coast of the US. It has its French counterpart in “Napoleon slept here”, which we have seen on our frequent trips along the famed Route Napoleon running from Grasse to Grenoble. Vallauris is one of those places that bases its appeal on a similar “Picasso slept here” claim. Ironically, we also learned during this latest visit to Vallauris that there is even a link to Napoleon himself! The commune of Vallauris Golfe-Juan is actually where Napoleon secretly slipped back into France from his first exile on the island of Elba in 1815. A statue of Napoleon, which was erected soon after this but knocked down and destroyed over the years, only to be revived once again in the 1930’s now stands with a plaque that marks the “real” start of that Route Napoleon. Anyway, this is a bit of trivia that doesn’t really have anything to do with the magnet of pottery for coming to Vallauris. But it does seem a bit of a stretch to celebrate today’s declining pottery reputation of Vallauris by linking it to the heydays that brought the fame of Picasso and his fascination with pottery as an art form to this town. A nostalgic and Napoleonic “slept here” kind of magnet, as it were. Anyway, back to Picasso and Vallauris. The exhibit is actually quite well done, although a bit haphazardly organized. We arrived at the top of the street and the old chateau housing the main Picasso exhibits at noon and were advised to come back after 2 pm since everything was closing down for the lunch hour at 12:30. We learned, however, that the featured exhibits were actually located in four different places, and it was only this particular museum that would be closed over the lunch hour. It was not clear exactly where those other locations were, but we did buy our tickets and looked over the printed programme. Sure enough, one of the other locations was just across the courtyard area – an old theater that was running a film about Picasso’s life in Vallauris. The lobby area had a life-size replica of Picasso at work and a detailed display of dates documenting his activities and relationships. As noted on the display, his time in Vallauris ran from 1948 to 1955. But the film was in French and half-way through. So we didn’t stay. Somewhere along the way, we got wind of his receptivity to the town in those days because of its being a hotbed of Communism. That has triggered some further searching to verify whether this was correct, but we haven’t been able to find any further commentary yet on the post-World War II politics of Vallauris Golfe Juan. We are sure the records are findable, of course, even though today’s political environment of the region is quite different – more a matter of right-wing extremism nipping at the heels of centrist governments. 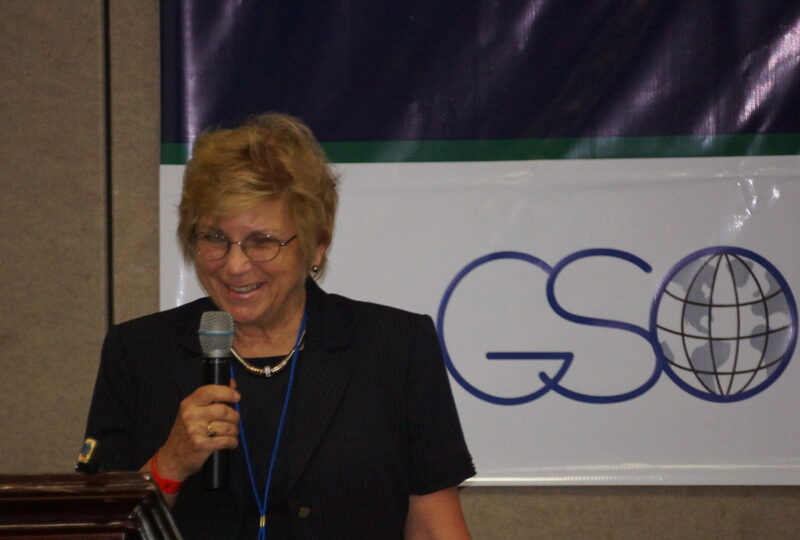 But we are interested in this post-World War II history and plan to investigate it further. We do know, of course, that Picasso became a member of the French Communist Party in 1944 and continued to call himself a Communist for the rest of his life. At least one of his works, “Massacre in Korea”, portrayed a pro-Communist scene, but he also managed to alienate the Soviet world in those days by painting a portrait of Stalin that wasn’t in the Soviet realism style. Oh well, he did have strong anti-war views that were most poignantly laid out in his famed “Guernica” of 1937 and years later his “War and Peace” of 1955. 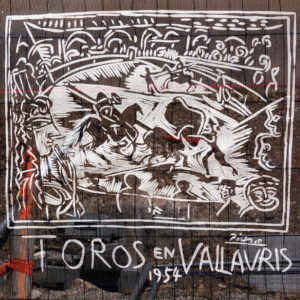 This latter work is in Vallauris and a featured part of the “Picassos Vallauris Years”. It is hard to photograph, since it covers the curved ceiling and three walls of the old chapel attached to the chateau/museum. As we have visited this panorama many times, we could describe its rich symbolism in detail – the forces of good and evil. But on this visit we were especially struck by one of its details, the dove as the symbol of peace. This symbolic linking of the dove as an internationally recognized sign of peace (and pacifism) was apparently a Picasso initiative, first directed to serving as a symbol of the Communist Party but more broadly evolving into a symbol of pacifism in the 1950s. Of course, the dove with an olive branch is a much older symbol of peace and love – and in Christianity, of the Holy Spirit. But this Picasso version was first depicted in a lithograph entitled “La Colombe”, a dove without an olive branch, for the World Peace Congress of 1949. 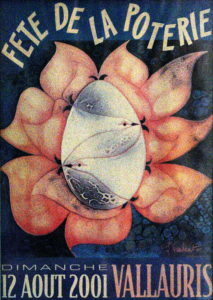 Although “La Colombe” was then incorporated into a symbol of the Communist Party, it also became more broadly a symbol of the peace movement in the 1950s. And it appears, once again, in the panorama on “War and Peace”. Enough said. 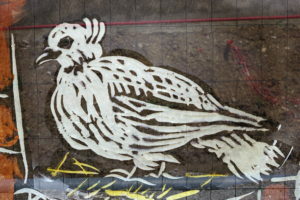 It was interesting to learn about the Picasso dove during this visit. Above and beyond this matter of the dove, we encourage readers to visit the painting itself for further symbolism. We only note here that Picasso might have been a pacifist, in name at least, but he was also a lover of bull fights. Another insight that we learned about his years in Vallauris is that he actively promoted numerous bull fights there – including the creation of lithographs for promotional posters. Not so nice, actually. The dove and the bull. Another interesting insight from this visit to Vallauris was about how Picasso became interested in Vallauris in the first place (above and beyond his reputed attraction to its politics). We came across this insight at the next place we visited, the Galerie Madoura. The exhibit here was very nicely put together to portray the close collaboration between Picasso and the owners in those days of this gallery, Suzanne and George Ramie. 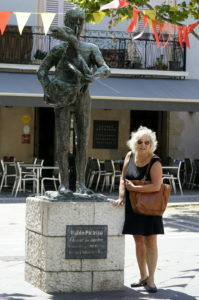 They were in fact instrumental in attracting the restless Picasso to the creative world of pottery and ceramics. It was their work on display at an exhibit in 1946 that caught his eye and led him to move to Vallauris in 1948. He collaborated with them in this Madoura workshop and kiln to produce thousands of plates and platters and vases and other pottery objects, of which some 543 “lots” were reserved for reproduction exclusively by the Ramies. The Galerie Madoura also features Suzanne Ramie’s own work, of course, but it was interesting to learn how Picasso built on the Madoura techniques to put together the portrayals of bullfights – and women, owls, goats, fish and whatever else that caught his fancy. Back at the main museum on the top of the hill, we were treated to a far more extensive collection of his ceramic works than we had seen in past visits. 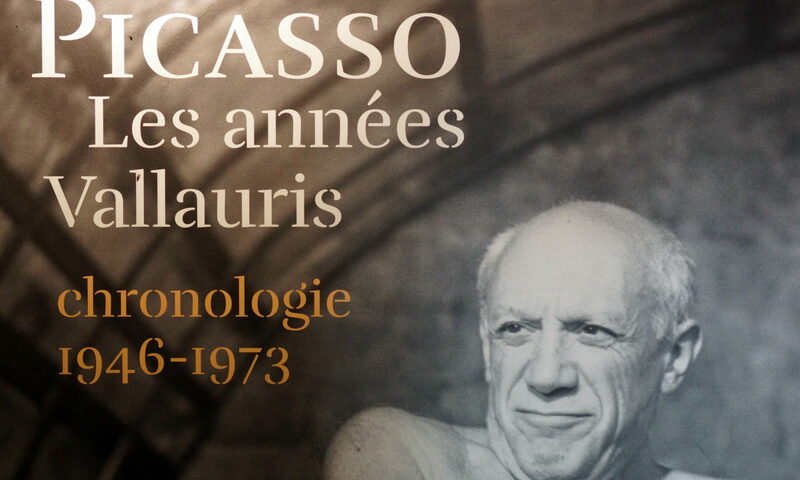 The “Picasso-Mediterranée” project, of which this exhibit is a part, is benefiting from the central repository of Picasso’s work and the main sponsor of the project, the Picasso Museum in Paris. The current display in the Vallauris museum is a truly remarkable collection of Picasso’s pottery – and lithographs. It was in both of these artistic mediums that he devoted most of his time in the 1950s, and the exhibit is very stimulating to absorb how his style evolved – and how it transformed how we relate to pottery today! Other parts of the exhibit depict his networks with other artists and writers plus another section on PHOTOGRAPHERS of Picasso! What? Oh yes! There were several of them, who supposedly became famous in their own right because of how they captured the personality and lifestyle of this awful man! What a con artist he must have been! Picasso’s ego was huge, and so was his appetite for women! The Vallauris years exhibit features his relationship with one of these women, Francoise Gilot, with whom he fathered two of his four children. And the exhibit actually depicts this period as his “family time” years! There is a charming photo of the proud man walking down a path from his villa in the sunshine with a happy Francoise by his side and his young children Claude and Paloma cheerily tagging along. We do know, of course, that Francoise left him in 1953 after ten years of abuse, subsequently married someone else but then divorced him in order to return to Picasso in 1961. But then what did Picasso do? Apparently on the same day as the divorce was granted, he secretly married Jacqueline Roque – IN Vallauris! There is more to this disaster, but we don’t need to dwell on it here. As far as the Vallauris exhibit is concerned, we noted that there is a sign pointing to a small room in the main museum, marked “Jacqueline Roque”– a room that is empty – nothing in it! What a statement! Before heading down the main street, we stopped back at the modest statue of “L’Homme au Mouton” in the town square just outside of the chateau. It is relatively unobtrusive but powerful in its own way. The title, of course, sounds better in French. Who cares about looking at a man carrying a sheep? Well, it is, after all, an allegorical reference to Christ as the Good Shepherd, but its symbolism is more about Picasso’s challenge to the Nazi occupation of Paris in the 1940’s when he first sculpted it to represent the struggle for freedom and peace. In any case, it is an example of Picasso’s work in another medium – sculpture – of which there are three copies – this one in Vallauris along with two others in Paris and Philadelphia. The idea, he reportedly expressed, was for children to feel free to crawl all over it. Another example of Vallauris as his “family time” years. The bustling array of local pottery workshops and storefronts used to be fun to show off to our many visitors to Villa Ndio. 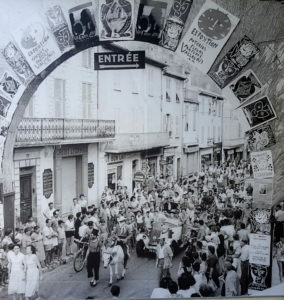 We especially enjoyed the occasional street fairs, like the one promoted in a 2001 poster, with festive sidewalk displays of original works, pottery-making on the spot and jazz musicians livening up the scene. Those days are gone. 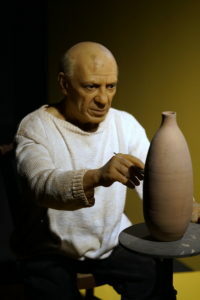 The “Picasso effect” has run its course, it seems, even though there were many famed and well-regarded potters and related artists who kept the Vallauris reputation alive over the years. One might surmise that it lasted some 50 years, since it was about then (2008), when we all endured the beginnings of the financial and economic crisis, when the main street of Vallauris really hit bottom. On this occasion, we continued to be saddened by the commercial decay of vacant or closed storefronts, shops with mass-produced pottery of inferior quality (imported from China even?) and even unrelated shops selling cheap clothing and trinkets. There were a few promising examples of higher-end art galleries returning to the scene, but even these had signs in their windows announcing rather limited hours. 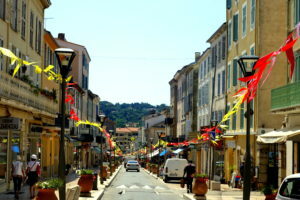 One bright spot that kept us coming back was the shop called Ardéco at the bottom of this main street. 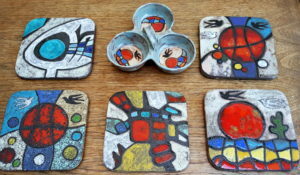 We had fallen in love with the unique pottery trivets made from lava and finished with contemporary designs in a ceramic glaze. There were also inlaid table tops, sun dials, trays and wall hangings from the lava, supplemented by similar artistic designs in more traditional pottery pieces – candy dishes, soup bowls and the like. We understood the main artist to be Martine Azéma, who ran the shop with her husband Gilbert, but we came to appreciate their work as a team. Even after she passed away in 2011, we continued to special-order pieces from him. Then, about a year ago, we were dismayed to discover that he, too, had passed away, and Ardéco had become yet another vacant storefront. But on this occasion, at the end of our walk down the main street, the bright spot reappeared! At least, we discovered that the shop in the same location with the same name Ardéco was back up and running! And lo and behold, some of the remaining Azéma samples were on display! What a thrill it was to find what looked like one of our last special orders on display – plus other pieces that reflected their wonderful style. Interspersed with this lost treasure were the other mass-produced tourist items of inferior quality, and we learned that the new shopkeepers were not artists themselves. They were merely the new tenants who had committed to selling off what was left of the Azéma pottery by the son who had inherited his parents’ work. He himself (the son, we learned, had no interest in continuing with the family tradition. Ah well, the joy was bittersweet. We splurged, of course, to acquire a good part of the remaining Ama collection, and we will always feature this work as our main cultural link to the region. Yes, of course, we have admired the work of Picasso, Matisse, Leger, Chagall – all part of this Mediterranean scene. And we have plenty of prints of their works – but no originals! And although we are not really connoisseurs of pottery-making, we have great memories of and appreciation for the work of Martine and Gilbert Azéma.